A focus on STEAMPUNK Madness & it's INSTRuCTOR! 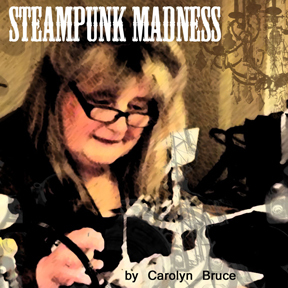 A class in the art of Steampunk…where Science-Fiction, Fantasy and Victorian style meet. Make a necklace, earring set and a pin. 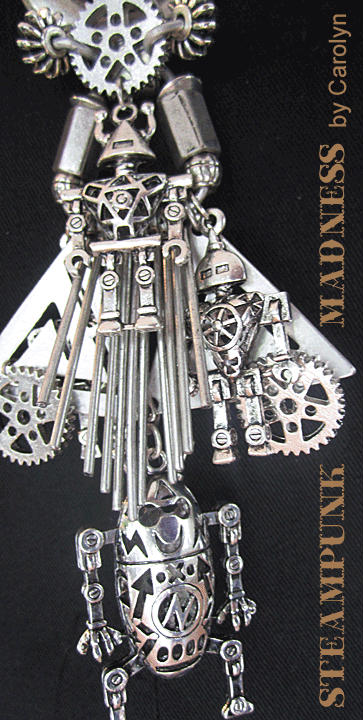 Incorporate keys, cogs, robots and watch parts into your own style of Steampunk Mayhem and Madness..!!! Age and patina metals to include in your pieces. Work in antique bronze and silver lead-free base metals to achieve you own unique style. Kits of parts and pieces included…additional items will be available for purchase from the teacher for future projects. Bring your favourite jewelry pliers and tools…all other items will be supplied. Which Artist inspires you the most & why? Len Castle – Potter – New Zealand Icon – very down to Earth, supreme Creative! What would you love to try next, creatively? Soldering. Where do you find your muse/inspiration? Everywhere… can’t turn it off. I like to teach because: I want others to have as much fun as I am! Who do you creatively relate with? I.E. Who does your work remind you of? A Mad Scientist … some days. The best part of living a creative life is: Fun is at your fingertips everyday. What is the worst part of living a creative life? Chaos surrounds you – As creatives are not as a rule tidy or organized – well not this one! What advice would you like to share? Always PUSH yourself to take the new leap of faith. The best advice I have ever received is: Just do it ~ Don’t over analyze it. ‘Being creative’ means: Not being afraid to be different in all avenues of your life. The thing I love most about my life is: It is finally taking shape. What makes your heart swell with joy?Watching people smile when they look at my work. My favorite ‘pretend’ curse word is : ‘BUGGER’! Previous PostPrevious What more could you ask for?